Sensors detect change in the environment and convert them into electrical energy. Piezoelectric sensors take on two forms to accomplish this: active and passive. Active sensors use a transmitter-receiver system releasing intermittent ultrasonic pulses to gauge the environment. Passive piezoelectric sensors, as the name implies, waits for a signal, like a microphone, and converts that into output. These piezo sensors operate below their resonant frequency for maximized range. Active sensors, as previously mentioned, utilize a transmitter-receiver system. The transmitter operates at its resonant frequency to optimize efficiency, periodically sending out ultrasonic signals. The receiver, upon obtaining a signal, generates an electric impulse. The delay is analyzed to determine distance or depth. Examples of this can be seen in level sensors or ultrasonic sensors. Passive sensors are much simpler. These specifically shaped piezoelectric materials generate electricity after receiving a signal, and are inactive when no signal is present. Passive sensors often operate below their resonance frequency to optimize their sensing range. Common applications include touch switches and accelerometers. Piezoelectric sensors have the natural advantage of high elasticity, which is comparable to some metals. This allows for a highly linear relationship between input and output over a wide range, while maintaining high reaction speeds. Most non-piezo sensors cannot replicate this level of reaction. Piezoelectric sensors are very versatile and can withstand various environmental extremes, such as high temperatures (up to their Curie point), magnetic fields, and radiation, which would otherwise compromise sensory data. The main restriction on piezoelectric sensors is their inability to operate in static environments. With minimal environmental change around a sensor it begins to lose its charge (this occurs at low frequency changes and high temperatures as well), causing decreased signals and corrupt data. 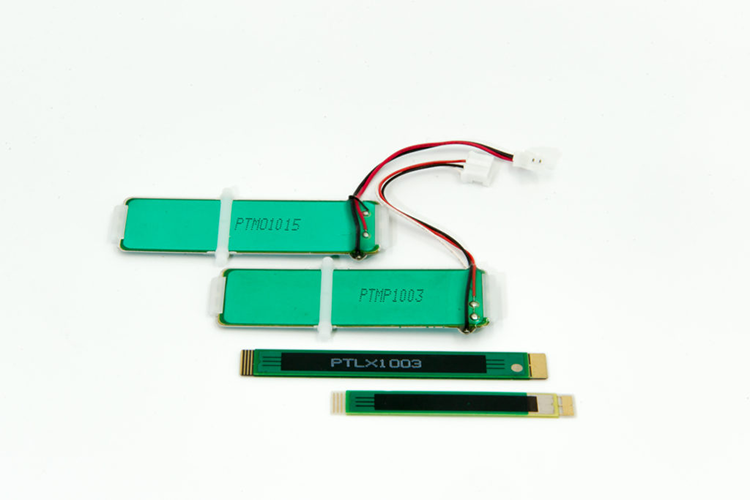 Piezoelectric sensors are most applicable in fast processes, such as explosions. This is due to their material’s quick responsiveness and resistance to deformity. In the example of explosions, piezoelectric sensors can quickly measure the changes in pressure, making them an invaluable tool for scientists. While there are still limitations in piezoelectric sensors operating in close-to-static conditions, computers have increased the range in which they can operate. By correcting calculable errors such as impedance, piezoelectric sensors have even been used to detect chemical subtleties in the air, such as aromas. One use of piezoelectric sensors is found in accelerometers. A slab of piezoelectric material is held perpendicular to the expected movement, and a block of material is loaded onto the slab. When the object accelerates, the block presses onto the piezoelectric slab creating a charge, which is then passed on to an amplifier or computer. Another common design utilizes a tube with a piezoelectric sensor at both ends. The tube is filled with a heavy liquid, then positioned parallel to the expected movement. These two sensors are polarized in opposite directions to respond to movement in both directions. These types of designs are commonly used in a wide range of applications, including laboratory environments and automobile functions.